We eventually left Karaj for Tehran, Monday 1st September. We used Sohrab’s instructions to get from the village the villa was located in to the freeway. Easier than the steep twisty way we came in he said. So we followed his directions until I shouted to Anthony: we’re going the wrong way, this is now a one way! We quickly do a U-turn. As we turn off, down the side road we’d just passed and ignored, I look back to see if we’d missed a sign – nothing! We should have just known/guessed. To avoid going right into the city of Karaj, which was the wrong way for us anyway, we set down all sorts of tiny, narrow, steep little streets, come across the odd dead-end, go back. In the end, it was much worse than the difficult way we’d come in a few days back and which Sohrab told us to avoid!!! I was quite pleased as I tackled them all ok, unstressed, even the final steep, gravelled T-junction up to the main road. So we eventually ride into Tehran. 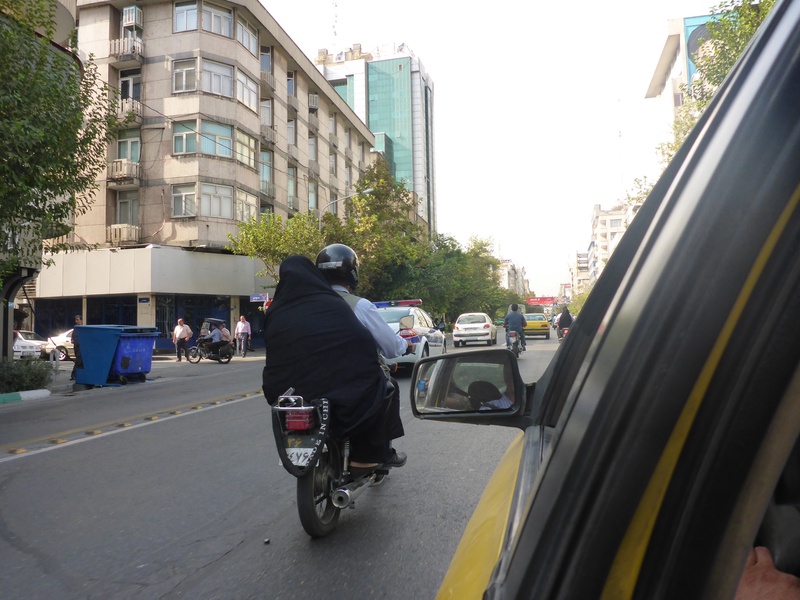 I have to admit I left the villa with a sense of trepidation at the thought of riding into Tehran, based on what we had been told by fellow riders. So this little exercise of getting ‘lost’ in the tiny streets of Karaj and tackling them with ease has given me confidence. We follow the GPS, mostly but not exactly because it occasionally tries to send us some obviously obscure and convoluted way. The GPS is Anthony’s role, unfortunately for him as it can be quite frustrating to follow especially in traffic. We ignore the ‘no motorcycle’ signs on the freeway into Tehran and pass police cars on a few occasions without any trouble. We eventually arrive at Saba’s just 10 minutes late – not bad really!!! Although 5 days later than originally planned. We drive down her steep driveway into her underground garage where we can safely store our bikes while there. It is so good to see Saba again! (we met in Brisbane while I was doing the Celta English teaching course). Her aunt is there too to greet us and tells us Saba has been waiting for us for the past week!! We contact Sohrab and Afrooz to let them we have arrived safely. We have so many friends worried about us and wanting us to check-in and let them know we have safely arrived – as if they were our parents. 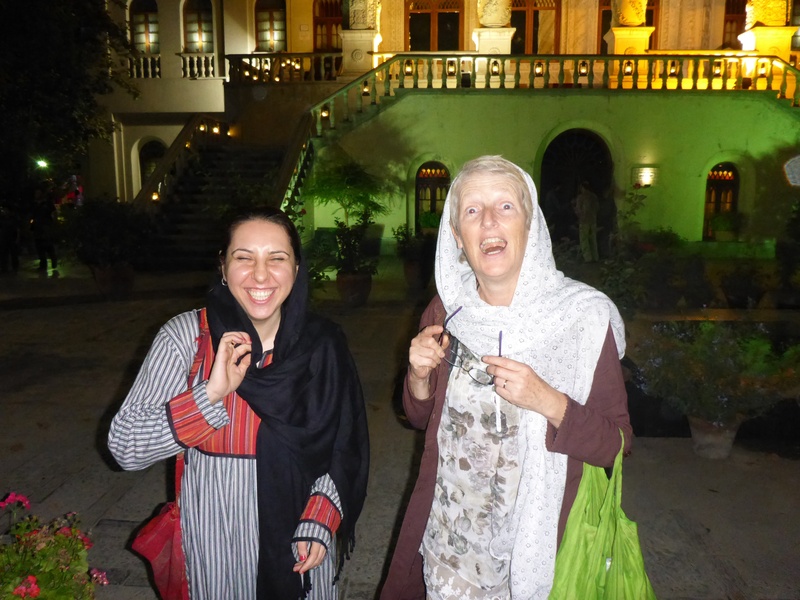 Another friend, Fariba, has desperately been trying to contact to see us too, but we had already delayed our arrival in Tehran due to our unexpected stays in Beshahr and at the Karaj villa, our priority is to see Saba who has been patiently waiting for us. Saba tells us her apartment is ours for as long as we want. Once again, we experience the wonderful Iranian hospitality. Lunch has been waiting for us. Saba is a great cook. Saba’s aunt is very interesting and speaks perfect English which is very helpful for us. She tells us about her current project, designing a 300 metre high concrete walled dam. Later we meet Saba’s parents too. We spend the afternoon chatting. A lovely lazy day. 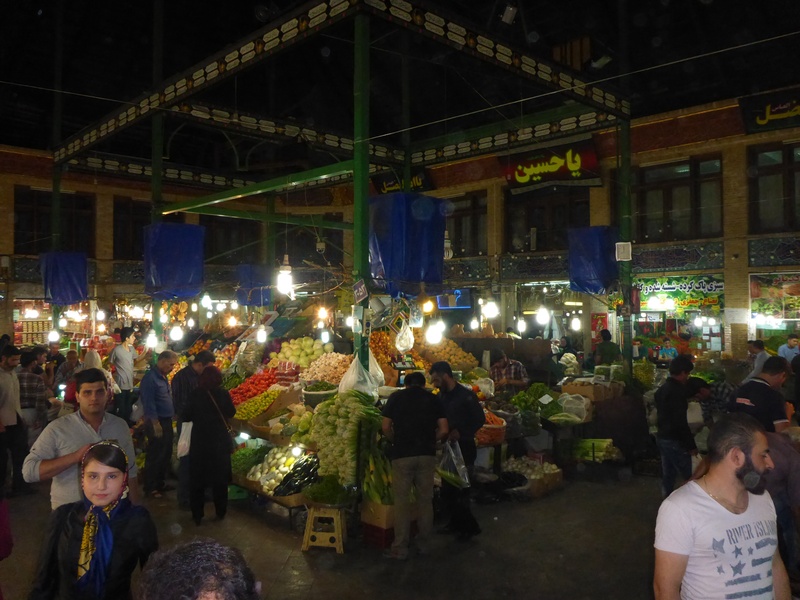 In the evening, we go to Tajrish square, a northern suburb where there is a bazaar and lots of little restaurants. Saba gives us the option of going by taxi or bus. Bus of course! As we are about to get on a bus, Saba explains that the front is for males and back for females, but if Anthony wants to join us, that’s ok. There is no law as such, but there is an understanding of where everyone’s place is. If one section gets too crowded, it can overspill into the other section. It is crowded as it is rush hour so we stand. I keep being offered a seat. Not because of my grey hair but because I am a tourist. 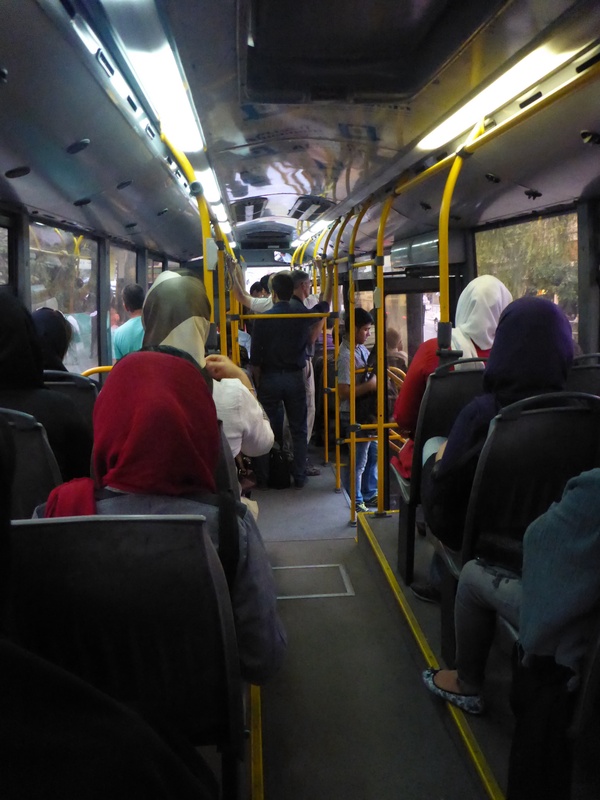 Two young women talk to Saba and ask her why she took me on a bus. I should be traveling in something more comfortable. She assures them it was my choice and I confirm that to them. And so we all chat (with Saba interpreting). Apparently, it is very common to people to chat to strangers. I can see that the segregation makes it easier for women to interact comfortably amongst each other. 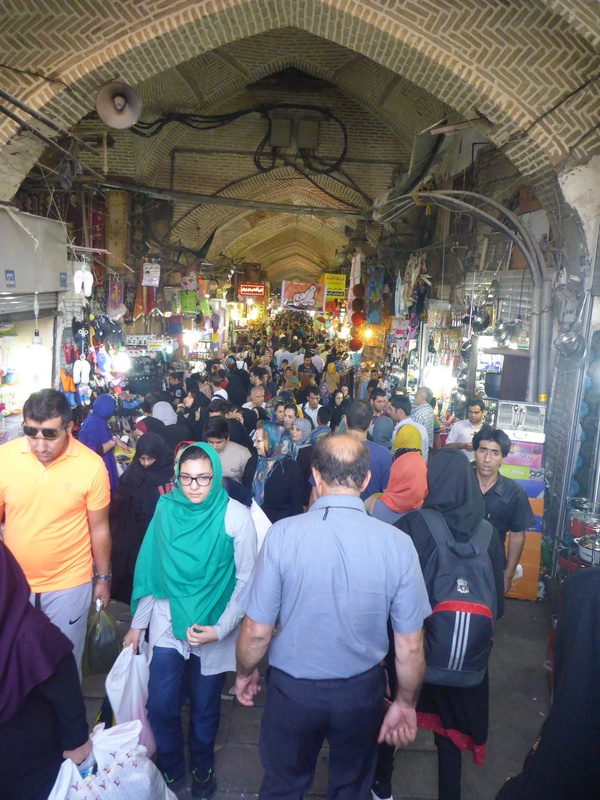 Tajrish is bustling with life. It is fantastic. The noises, the smells, the sights – it’s alive. We must look like kids in a candy shop, all wide eyed. We stop to look, to smell, to enquire and yes, to take photos. It is not our first bazar, but this particular one is full of locals only shopping for food, spices, clothes, anything really. There are no tourists. 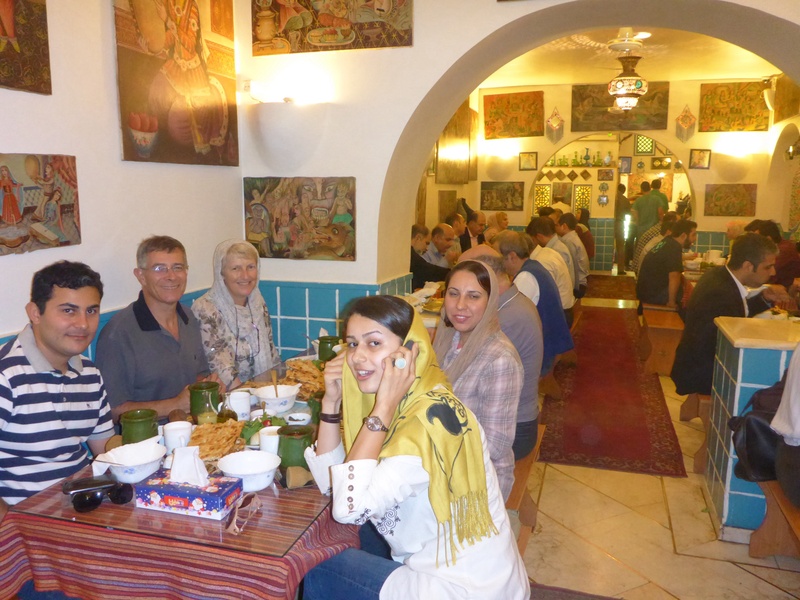 After a slow meander through it, we go to a tiny restaurant on Tajrish Square. Saba wants us to try two traditional dishes. One we loved, osh, a sort of noodle and vegetable stew, the other we weren’t that keen on – some sort of savory porridge. Osh was quite filling and a bowl was all we felt like for dinner. We can’t pay so we offer to get tea. We go to a lovely outdoor coffee shop near the film museum. 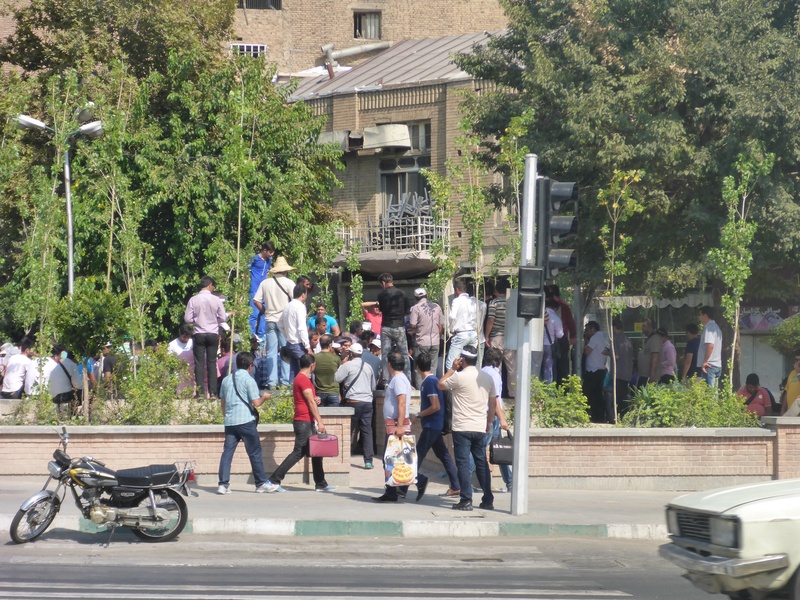 We love the fact that even in Tehran we seem to be the only tourists. That is of course thanks to the fact that we are shown around by Saba. We get up late and have a lovely lazy morning. We meet Saba’s cousin who lives upstairs. She’s brought back our washing, beautifully folded into a little parcel. This is our 2nd machine wash since Moscow (first one was in Beshahr). It might sound totally trivial, but that is luxurious for me!!! Hand washing every couple of days can be tedious at times. Time for a late shower before going out. Although we are in the capital city, we have to remember, like in the whole of Iran, not to flush toilet paper down the toilet as the sewerage system does not handle it. You are meant to use the separate hand shower which is always provided next to the toilet bowl or ‘squat toilet’ to wash yourself. We have lunch at a favourite restaurant of Saba’s with her father and meet up with 2 of her friends. There appears to be a set menu of dizi – a stew served in a tall cylindrical dish and which has a certain ritual in the way you eat it. You first tear little pieces of bread and place them into your bowl, over which you pour out lots of the broth. You eat your ‘soup’. Then, you mash up the remains of the container with a sort of pestle: in my case, you first carefully remove all large chunks of fat off the pieces of meat, then pound the meat, potatoes and chick peas and remaining broth into a thick paste. Then you spoon dollops into a piece of bread and eat. It is very filling and delicious. It is Saba’s father’s treat. Once again, we cannot pay or contribute in any way. We then visit the National Jewelry museum. And come across our first tourists! A whole coachload. That place is like Fort Knox. We go through 4 security screenings. Some tourists complain. The amount of jewels is amazing, mostly incredibly elaborate, but more amazing to us was the number of bowls full of rubies, emeralds, diamonds etc. Just stock for more jewelry. Fariba picks us up from Saba’s just before 9pm. Unbeknownst to us, her two sisters, brother and his fiancée want to meet us too. 6 of us pile into his car (it’s only a 5 seater, but so what) and we meet up with his fiancée up the hill. It takes us an hour and a half due to traffic. Shall we go for a walk or have dinner first? Dinner!! We are starving!! Our bodies have not got used to such late dinners yet. We didn’t get our walk in as the kitchen forgot our whole order so we ate really late. But what a feast. And stunning setting – sitting outdoors with a view of the lit rock face of Sangan. 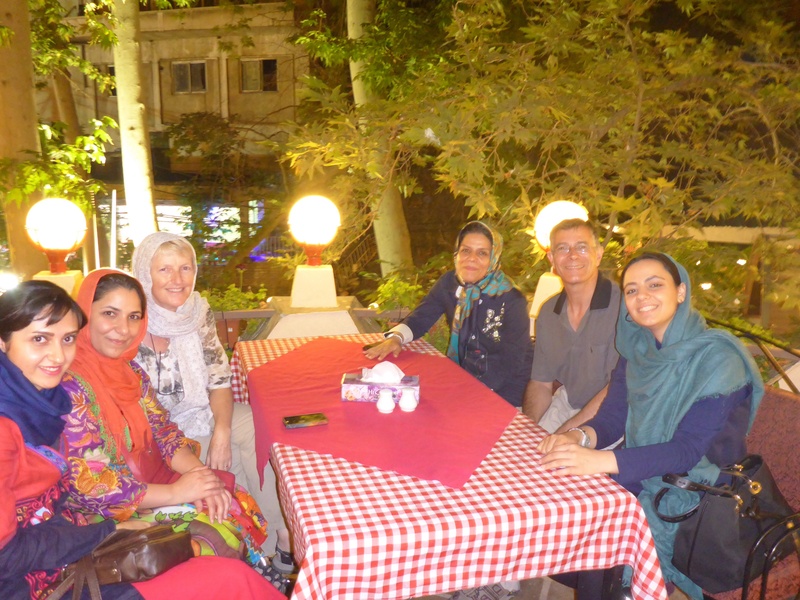 Conversation is interesting – Iranians we have met are all highly educated and qualified. At our table, we have several engineers and an English teacher. Our ease of travel is something Iranians are very envious about. So many Iranians have dreams to travel but getting visas from countries like ours is very difficult and sometimes impossible for them. Anthony’s having trouble with a tooth we suspected he cracked on a cherry jam stone the other day and eating chicken this evening has aggravated it. Fariba has a dental appointment tomorrow morning and offers to give Anthony’s her appointment and she’ll make another for herself. And she can show us to a carpet shop straight after and leave us to wander on our own from there. That is when we decided we would have to change our timetable and our route. Tomorrow will now be spent at the dentist and the bazaar, and we won’t have much time with Saba. She had asked us to stay longer so many times. So why not. We’ll leave another day later. But that did mean we had to skip … Shiraz and Persepolis… Yes, we can hear you from here already!! We know, we know. It is the most beautiful, most interesting city, we have to see Shiraz. We know but: we can read about it, we can see and buy more stunning photos than we could ever take of those treasures ourselves, but we could never ever buy the people experiences. Our choice is easy. One day longer in Tehran and then we can take an easy leisurely route down to Banda Abbas. Why didn’t we have time for Shiraz? What’s the rush? Visas, once again. We have a 4 week visa for Iran and we have to get to Banda Abbas by a certain date to do the paperwork to ship the bikes to Dubai, and boats only leave 3 times a week. Shiraz is on a different road to Yazd/Banda Abbas and it would mean an additional 900kms round trip. And an extra 900kms is one thing, maybe not that much, but doing the same journey twice in this heat is too much. So Shiraz will be for our next visit. Anyway, back to Tehran. The next morning, off we go with Fariba, and one of her sisters, to her dentist – the traffic is horrendous and the fumes sitting in the taxi and traffic jams finally get to my head. Anthony is shown to the dentist’s room – there is another patient in another chair in the same room. That’s efficiency. Verdict: Anthony has damaged his tooth but the extent of the work required will only be evident with an x-ray which can’t be done there and the treatment may require 2 or 3 visits. We don’t have the time and the tooth is bearable. It should last until Dubai if he is careful and lucky. We get the painkillers and antibiotics the dentist prescribes just in case, which cost a whole $3!! The cost of the consultation remains a mystery – we are not sure if the dentist didn’t charge, or Fariba paid, but as usual, we were not able to pay anything. Next we head to the large bazaar by metro this time. It is massive. We wanted to have a look at carpets and have a little time to wander through the bazaar alone but as luck would have it, Fariba’s family know a carpet seller well so we’ll head there with her. But first lunch. Ok. And miraculously, another of Fariba’s sisters is there too. She tells us she has cleared her diary to spend the rest of the day with us. How unexpected but kind. When we go to the carpet shop and we are asked why we don’t like the carpets we see on the wall and what design we want, I don’t want to see anymore, it will be all too hard. I feel guilty at wanting to leave the bazaar when these kind Iranians are giving up their time for us. I am feeling torn. And my head hurts. It has been great to see Fariba again, meet her family, hear their feelings about their country, their dreams, their hopes, their frustrations, their views, their beliefs. We’ll next meet again in Brisbane. It has surprised our Iranian friends to see the number of people who come up to us or stop us in the street just for a chat, asking the same questions: where are you from, welcome to Iran, what do think of Iranians, do you like Iran, what cities have you been to, is that your husband/wife, how many children do you have, welcome to my country! Often, it is followed by where are you going next, where are you staying, you can stay at my house. Our last day in Tehran, with Saba. What a fantastic day. Saba takes us to see the palaces of Saadabad, with its stunning gardens. We wonder there until closing time at 5pm and were headed home for a rest before going out for dinner when Saba got a phone call that her parents had broken down and were stranded waiting for a rescue truck to turn up. Quick change of plan and we pick up mum and go to Saba’s grandmother who lives nearby. It has amazed us how fluid everything here is. Plans change, new ones are made, and always, people just turn up. Sometimes, we think plans have been changed on the fly (like picking up parents who have just broken down) and new ones made on the fly (like taking the mum to grandmother’s place nearby while the car is being seen to) but it seems everyone was waiting for us – another aunt, friends, grand mother. Our welcome at Saba’s grandmother’s home, which we thought was a spontaneous detour following Saba’s parents’ car breakdown, is incredible. So many plates and bowls all over the lounge, full of fresh fruit, nuts, Iranian sweets, cakes. 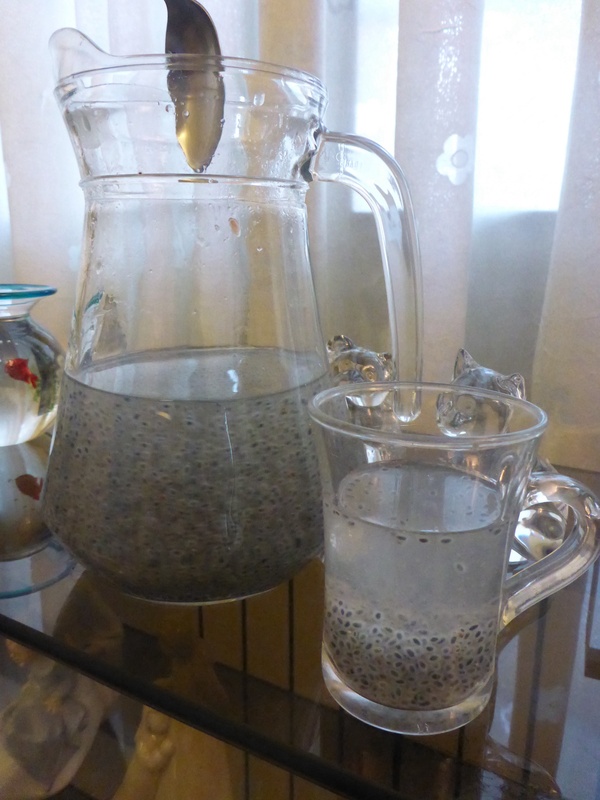 We are served an amazing fresh fruit drink made from basil flower seeds. Saba’s aunt speaks fluent English which enables us to have in depth discussions on politics, religion, economics, travel. 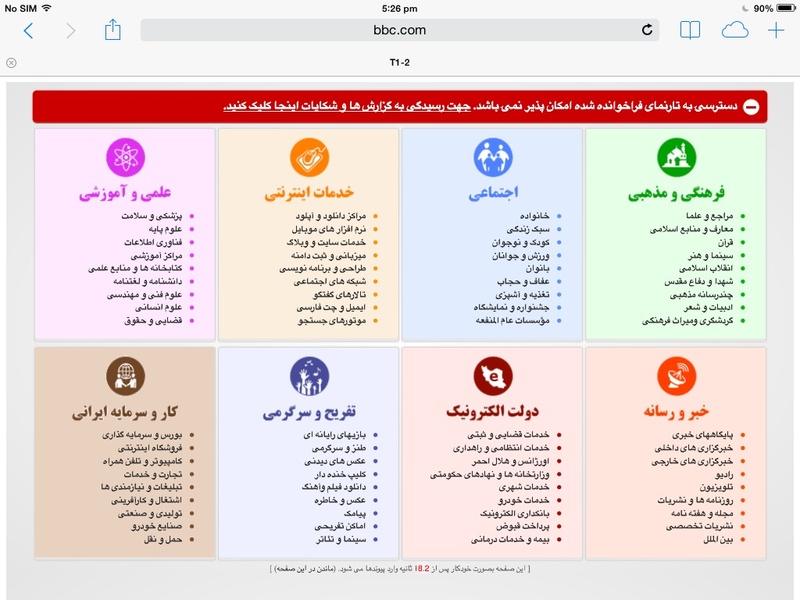 It is so interesting and gives us yet another glimpse into Iranian life. 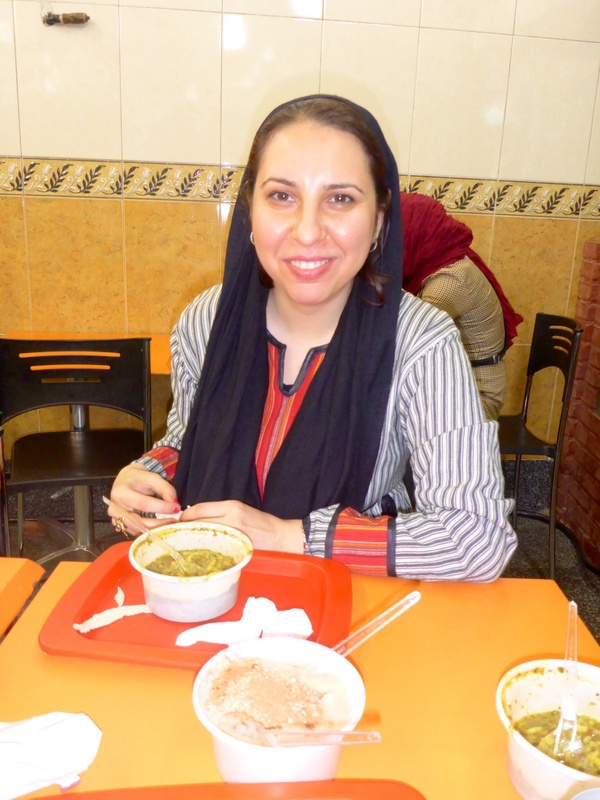 Tonight, after leaving Saba’s grandmother, for the first time since we arrived in Iran 10 days ago, we are allowed to pay for a meal. 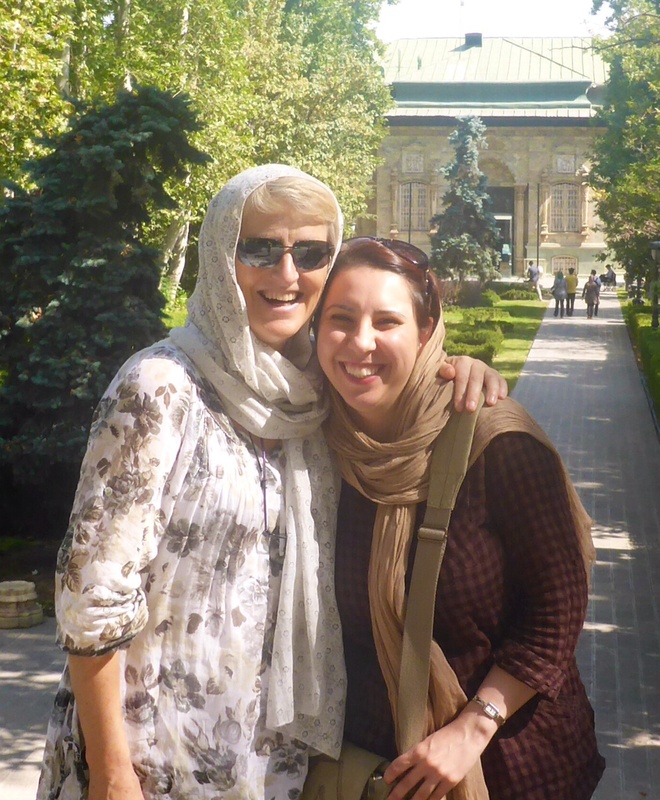 Apart from the incredible hospitality we have been shown, what is Tehran like? Tehran is a huge city – 11 million by night, 17 million by day. 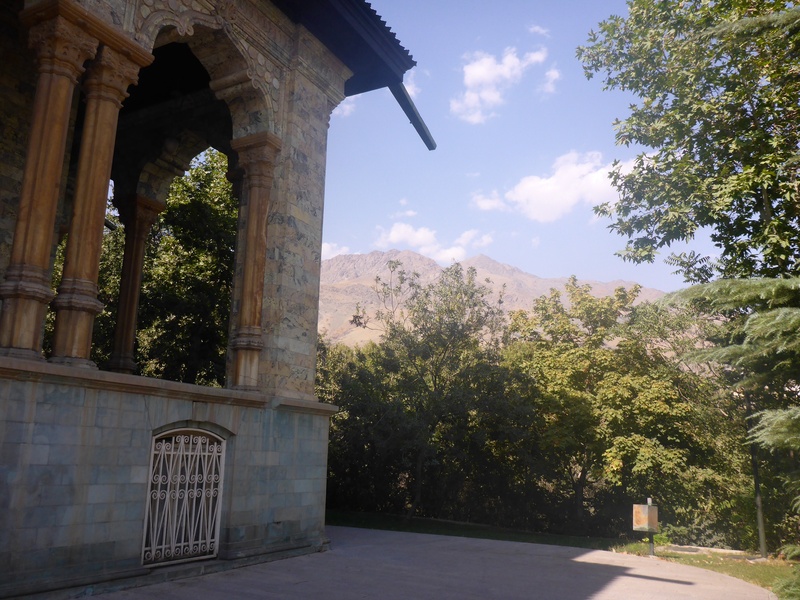 It has a stunning backdrop of the Alborz mountains and seems to sit on one massive hill side. Most streets are tree lined. Water runs through the streets constantly, down a deep channel between the road and pavement. 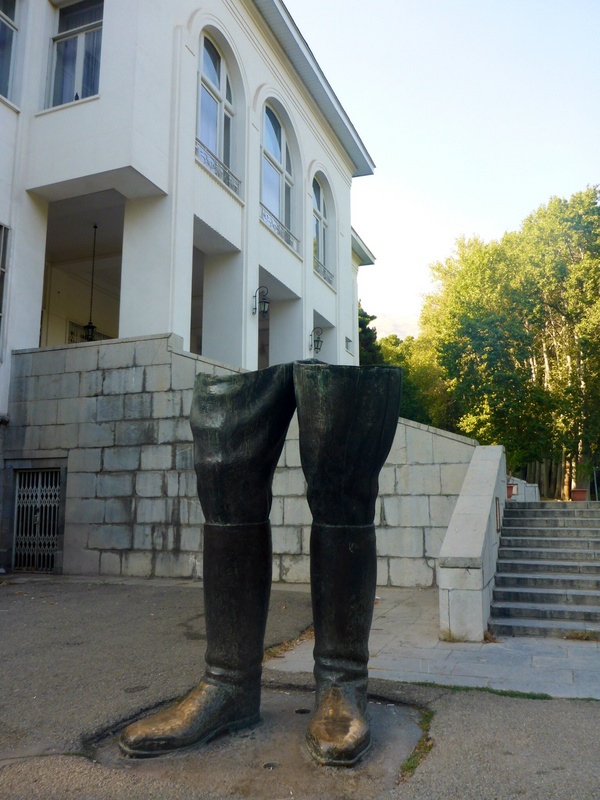 While Buenos Aires reminds us of Paris, Tehran has its own distinctive feel. And traffic, well, that deserves its own full post as you may have already read. One last thing I’d like to say on that subject however: while it is total anarchy on the streets, it is also a great lesson in tolerance and adjustment and something our Australian drivers could learn from…. The lack of road rage is rather refreshing. I think my mother must have Iranian blood in her as she certainly knows how to entertain and welcome people. Read the content you’ve written in the past few days .. I wish I could say they were there that night , Would have to change your sleeping place more comfortable and cooler……….!! Sohrab, we were simply commenting on the weather and heat. There is nothing more we could have wished for or that you could have done for us. We hope that one day we can return at least some of your amazing hospitality. And don’t worry, I already have selected the photos of our time at the villa to upload once we get to Dubai. Take care! Now for Tehran, and my first hope is that it was indeed a headache and not the dreaded migraine, and also that it was soon better. Your tooth, too, Anthony. Fully understand and go along with your decision to skip sights in favour of delights, those of time with friends. Persopolis and Shiraz will still be there when you return. It is not what I mean.. Warm air, ,in sleep’s time ..soo excuse me .. If I had known about your teeth problem ,Take you to the Very professional dentist with myself … (hi has Specialty Board Of u.s.a ,for Surgery & Elegance Restoration)..
His office Is near in the ” tajrish square ” … You could go there with saba..
We didn’t tell you because the pain started in Tehran on our 2nd night!! And we got an appointment the following morning with our friend’s dentist. All our Iranian friends, including you, are looking after us so well, we are so grateful. Folks. Your Iranian friends sound really nice warm people, the picture you paint is great I wish I was with you to meet them. Take care, let me know what dates you are in Dubai I may be a let to stay over.